Light Detection and Ranging (LiDAR) is surveying technology that measures distance by illuminating a target with a laser light. These light pulses—combined with other data recorded by the airborne system— generate precise, three-dimensional information about the shape of the Earth and its surface characteristics. 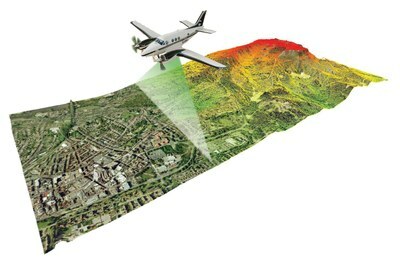 LIDAR can also be used in any situation where the structure and shape of Earth's surface needs to be known. Why do we need LiDAR for floodplain mapping? 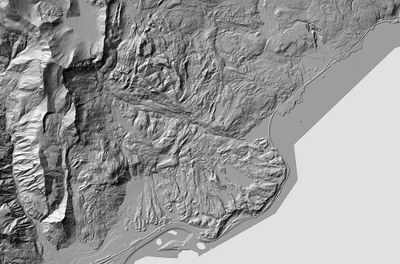 LiDAR data is the most detailed and accurate elevation information available. This allows us to model how water will move through the landscape and what areas may be flooded from surface water flooding. 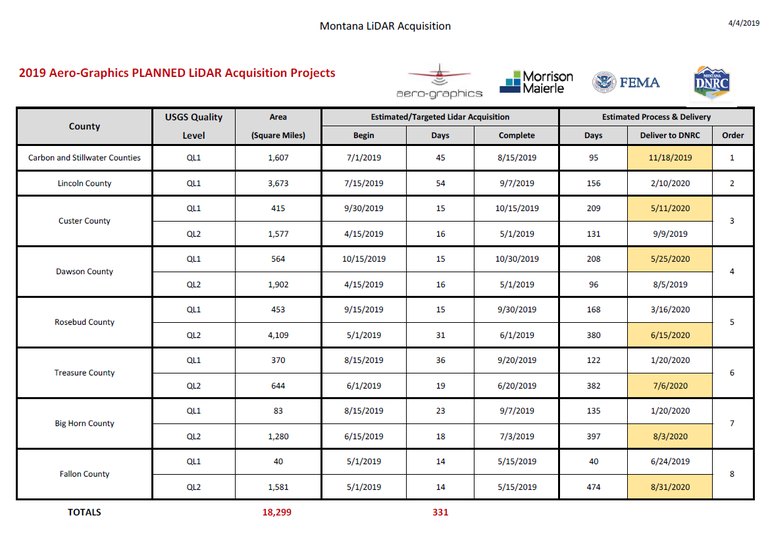 What is the status of LiDAR collection? 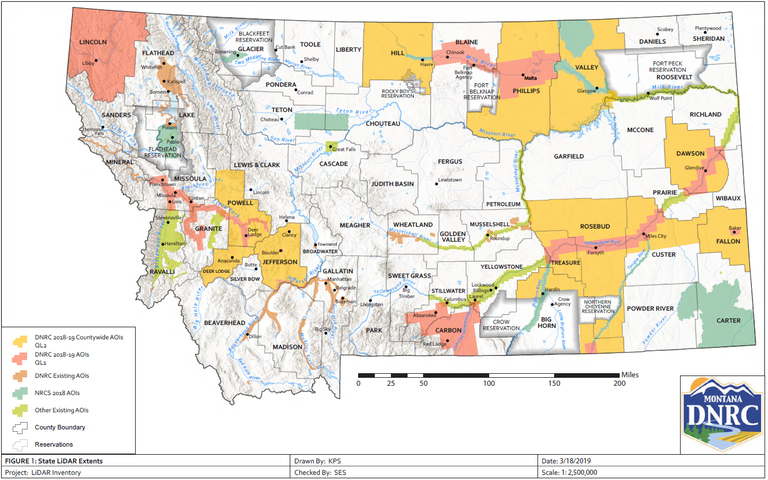 Click here to view a larger image of the map for LiDAR collection across Montana. What is the schedule for upcoming LiDAR collection? Click here to view a lager image of the LiDAR schedule from Quantum Spatial. Click here to view a larger image of the LiDAR schedule from Aero Graphics. 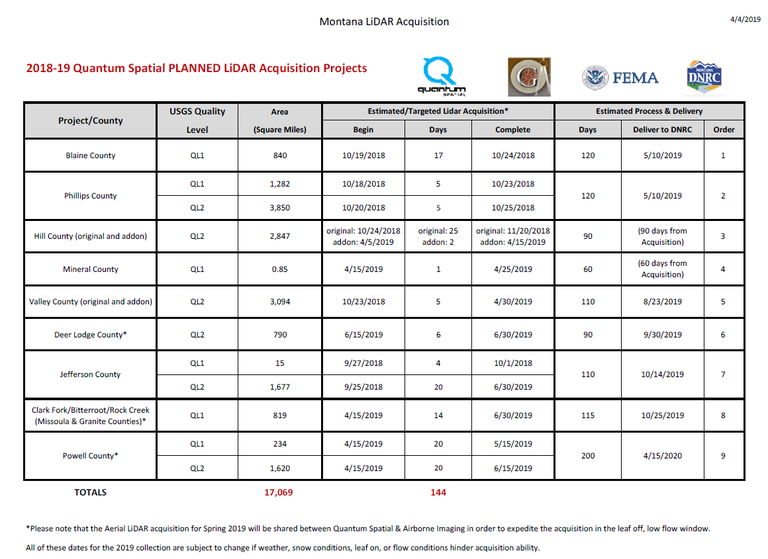 Who is DNRC partnering with to collect LiDAR? For weekly status reports from DNRC contractors on LiDAR collection click here. Weekly updates will begin mid to late April 2019. Updates will begin mid to late April.